Industry slump after record first quarter this year; accumulated sales for the first nine months of the year now down 2.2%. 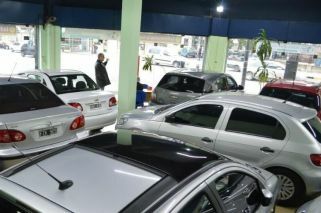 Sales of new vehicles collapsed 34.7 percent in September year-on-year, a third month of decline, the Association of Automotive Dealers (ACARA) reported Monday. Accumulated sales for the first nine months of the year now amount to 686,089 vehicles, aided by record numbers registered in the first quarter. Given the sharp fall in activity of late, the accumulated year-on-year comparison has now turned negative, minus 2.2 percent, for the first time this year. "The difficult scenario that we have been observing is becoming more complex. The financial turbulence that has slown down economic activity in general, and our activity in particular, means that we had a very strong year-on-year fall in September," explained ACARA President Dante Álvarez, in a statement. He said that "if in the last quarter we continue with these levels of activity we will end up in 2018 below what [we sold] in 2017," when a total of 901,017 vehicles were sold, including cars as well as light and heavy commercial vehicles. The automobile industry was one of the engines of Argentina's economy in 2017.